Let us Tap into your Problems and Trap it! Servicing Domestic and Commerical Systems. Why use Taps & Traps? We have all the industry standard tools and we're regularly updating our stock with the latest plumbing equipment! 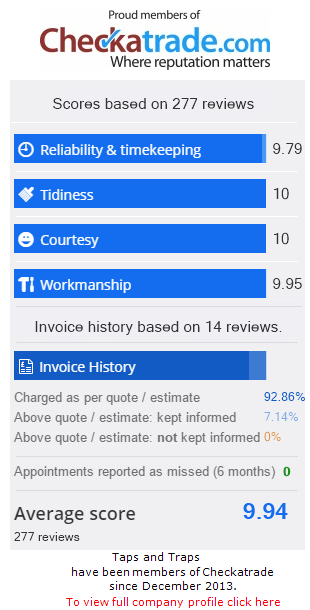 We're convinced, that any good service simply must be also an affordable service. That is why we always keep our pricing at bay. Maybe you've had your hot, cold or both kinds of water supply cut? If anything of that or inline with that is the case, then you'll probably love our timely and affordable plumbing servicing! “Would highly recommend this company. Called him on a Friday he answered straight away and boiler fixed within 3 hours.